Click here, first up in the Audio on Demand. Also check out Keyboard Militia’s post on the subject. Arizona Gov. Jan Brewer, claiming to “reject” the Obama administration’s assertion that the border is more secure than ever, announced Monday that she’s directing $10 million in federal stimulus dollars to tackle smuggling and illegal immigration. Reboot Congress has a good write-up as well, so also does Sharp. The Southern Illinois Tea Party rooted for the Cards while showing support for Arizona on Monday and yesterday the St. Louis Tea Party showed their support. We wore our Cardinal red and sat with our Arizona flags. With Arizona is in town taking on the Red Birds, some local tea party members came to Busch Stadium to show support for the State of Arizona and the state’s controversial new immigration law. We’re supporting the State of Arizona in simply guarding the borders,” said St. Louis Tea Party Member James Durbin. Some 46 members of the St. Louis Tea Party took in Tuesday night’s Cardinals match-up against the Arizona Diamondbacks. The Cardinals organization declined our request for an on-camera interview Tuesday night, but they did describe Busch Stadium as a “big tent” where people of all perspectives are welcome. Cardinals Manager Tony LaRussa says he stands behind what Arizona is doing in terms of immigration. During an interview before tonight’s game against the Diamondbacks, he had little to say when asked about a contingency from the local Tea Party that planned to show its support for Arizona and its controversial new immigration law in the stands. In fact, he said he didn’t even know they were coming. LaRussa did say he felt any kind of political demonstrations being made in the stands would be easy for his team to ignore. What Was That About Nazi Signs? Can I point out the irony of the left using Nazi signage as a way to claim persecution yet they continue to side with groups like Hamas whose statements against Israel sound like something lifted from Hitler’s diary? 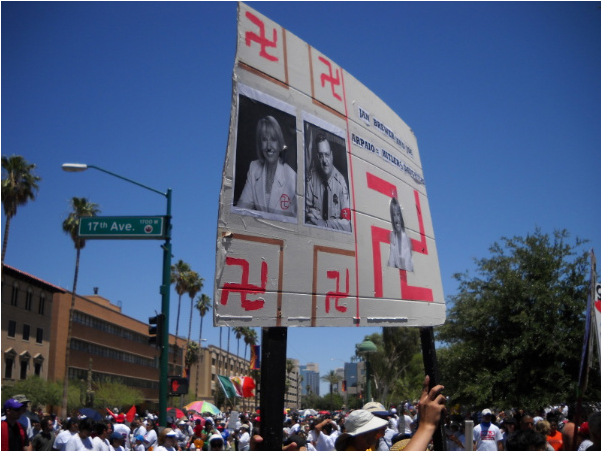 American Power has a great post of the zany leftist groups, pro-trespass, and others who comprised the rally against the law in Arizona, including photos of the NUMEROUS naturalization, immigration, passport, and offices of other such services located all throughout Phoenix. I’ve said it before: It amazes me the cosmetic quality of immigration concern from some on the left. It’s easier to encourage trespassers to break the law and riot in the street and hold protests denouncing leaders as Nazis than it is to actually pitch in and help these individuals become legal citizens. Conservatives are all for immigration. FTW! Bring more people over, add to the economic base, contribute to society! But just as immigrants from every other country are expected to abide by the rules when seeking citizenship, so must those coming from Mexico. Some on the left don’t seem to care that encouraging trespassers to engage in illegal activity might hurt their chances at obtaining citizenship. They don’t care; they’re happy to use these ethnic individuals as tools for the leftist cause. I’ve featured on my show religious groups (in St. Louis even) who assist prospective Americans with becoming citizens. Where are the secular groups who do this? What happened to all the people on the left who would gladly gum for the camera and carry signs but scrammed after the protest, why did these individuals not stay and give of their money and time to help these prospectives become naturalized citizens? The Phoenix Suns, with all their millions, why have they not donated any of their money or time to help these individuals become citizens beyond a cosmetic jersey-change which gave them more press than usual? Why are they not raising awareness for the groups which assist with naturalization? Why are they not taking up donations to offset fees to file? Why are they not petitioning their elected officials to make the process a bit easier or less expensive? Why are they not criticizing Mexico’s law and calling it “racist” as it is exponentially more stringent than our own?